Stunning conclusion to the Thirteen series Avery has just one chance to save her life--and the lives of her friends. Candlelight danced on the gold-gilded walls and illuminated the stained-glass windows. She held her breath and started down the aisle, determined to not let this opportunity pass. Every silent step reminded her that a thirteen-year-old discovered in this castle was as good as dead. But not talking to the king could mean a death sentence for everyone she loved. The king is very ill and in a hurry to hand over his power to a new generation when rumors begin to circulate through the kingdom. It appears the king is unaware of the queen's sinister plot against the thirteen-year-old orphans, as she wants to ensure her child becomes rightful heir to the throne. Avery weighs the pros and cons of seeking an audience with the king while the castle is dealt a heavy blow; but Avery decides the risk is worth taking, and she steps out of the shadows for the first time since entering the castle walls. When Avery is offered the opportunity of a lifetime, will she choose a life free from hardship within the castle walls. . .or her family and the home she left behind? 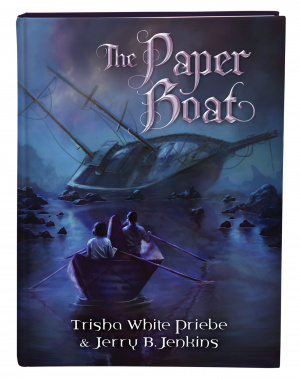 The Paper Boat is Book 3 in the Thirteen Series. The Paper Boat by Priebe, Trisha was published by Shiloh Run Press in April 2017. The ISBN for The Paper Boat is 9781683221784. Be the first to review The Paper Boat! Got a question? No problem! Just click here to ask us about The Paper Boat.